The Kestrel Eye is a small, low-cost, visible-imagery satellite prototype designed to provide near-real-time images to the tactical-level ground Soldier. Kestrel Eye was launched to the International Space Station (ISS) as a payload aboard the SpaceX Falcon 9 from Kennedy Space Center in Florida on Aug. 14, 2017 (Photo courtesy of SMDTC). 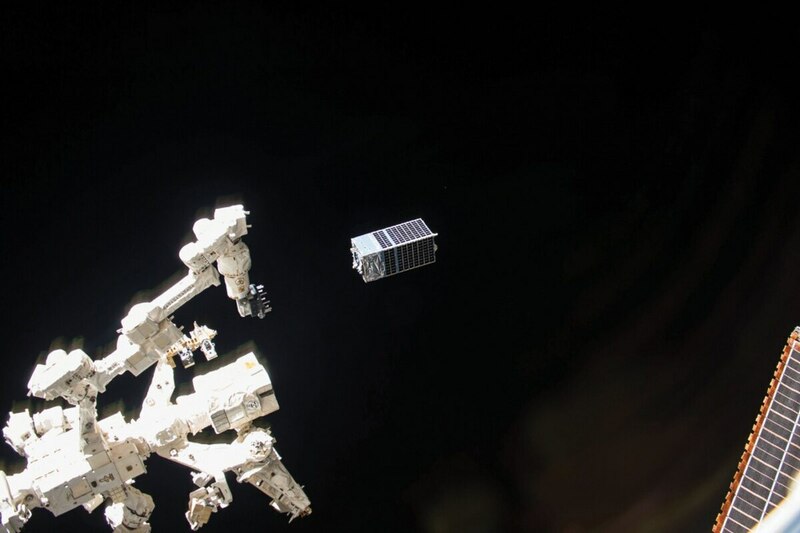 Industry leaders at the Satellite 2018 conference continued to tout small satellites, long an object of fascination in the space community, as a potential benefit to the Department of Defense. Small satellites range in mass from a few kilograms to half a metric ton. These mini satellites can be used for gathering intelligence, surveillance and reconnaissance capabilities at a fraction of the cost of larger satellites that the government typically launches into orbit. Virgin Orbit will launch a series of small satellites for the Air Force from their LauncherOne rocket in early 2019. Resilience has been a key factor in the Pentagon’s approach to space technology, especially in recent years as adversaries such as Russia and China begin to act more aggressively in space. DoD officials are increasingly viewing space as a potential battlefield and are designing spacecraft accordingly. Part of their concern includes ensuring satellite communications remain in tact during conflict. But some Defense Department officials are skeptical about Hart’s line of thinking. The Pentagon’s embrace of small satellites for military use has been limited. Small satellites’ size often limits the payloads they can carry and the amount of critical information they can gather. In October 2016 senior Air Force officials said they were uncertain about the future of the technology and that small satellites also lack the self-defense capabilities necessary to ward off an attack, leaving them cost-ineffective. The Defense Advanced Research Projects Agency (DARPA) has taken an interest in small satellites as an avenue to prepare for a more militarized space environment. The agency is currently working on several programs aimed at developing small satellite technology such as miniaturized sensors and laser communication systems for relaying information back to ground. Stephen Walker, the director of DARPA, has said the agency is looking at how to leverage industry partners working at low-Earth orbit and how the Pentagon buys smaller, cheaper satellite buses.